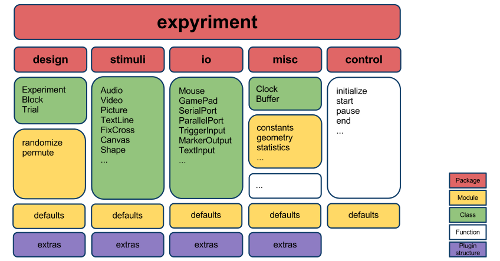 Expyriment is an open-source and platform independent light-weight Python library for designing and conducting timing-critical behavioural and neuroimaging experiments. The major goal is to provide a well-structured Python library for a script-based experiment development with a high priority on the readability of the resulting programme code. It has been tested extensively under Linux and Windows. Expyriment is an all-in-one solution, as it handles the stimulus presentation, recording of I/O events, communication with other devices and the collection and preprocessing of data. It offers furthermore a hierarchical design structure, which allows an intuitive transition from the experimental design to a running programme. It is therefore also suited for students as well as experimental psychologists and neuroscientists with little programming experience. Expyriment is free software and released under the Open Source GNU General Public Licence of the Free Software Foundation. If you want to make suggestions to improve Expyriment or you found a bug, please post your comments to the Expyriment issues page or contact us directly by sending an email to info@expyriment.org. Expyriment newsletter: All users of Expyriment should subscribe to the Expyriment newsletter, since the project is still under development. All modifications and new versions will be announced via this mailing list. (Visit website or send an email to expyriment+subscribe@googlegroups.com). Expyriment users mailing list: If you have questions regarding the installation, usage or documentation of Expyriment please don’t hesitate to contact the Expyriment users mailing list (visit website or send an email to expyriment-users+subscribe@googlegroups.com) or contact us directly by sending an email to info@expyriment.org. The new official Expyriment support forum can be found at http://forum.expyriment.org. If you are looking for a graphical experiment builder, we suggest OpenSesame, which uses Expyriment as the default back-end: http://www.osdoc.cogsci.nl/.